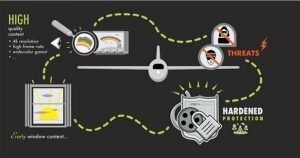 Before we get started on IdeaNova’s new content security solution for aircraft entertainment data we should tell our readers that as inflight entertainment content is getting to be higher quality, as you might guess, movie providers are getting more concerned about hacking and content copying because they have a lot invested in it. Thus, the value of secured DRM is a bigger deal, and security solutions are what will provide travelers with newly released content. So, along came IdeaNova and their solutions. 1. Why was the security software developed? 2. How it was developed? 3. How about a little history of the company and its founder for our readers? 4. Well then, can you tell our readers what the content industry is saying about the design? We then asked Rich what pieces of hardware and software IdeaNova provided, and he told IFExpress: “One clarification: the hardware chip on the motherboard is not IdeaNova’s chip; rather, it is an industry standardized chip. IdeaNova is the first to implement the chip’s use in the IFE market, as the studios are specifying that it be used for their latest HD and even higher quality content. You can find more info on this here. Trusted Platform Module (TPM, also known as ISO/IEC 11889) is an international standard for a secure cryptoprocessor, a dedicated microcontroller designed to secure hardware through integrated cryptographic keys. Stay Tuned on this one! « Hot Topics of the week in IFExpress – IdeaNova, AeroMobile, Astronics, Thales, and More!